Tina Satchwell and the search site. GARDAÍ SAY THEY have found a ‘key piece of intelligence’ about missing Tina Satchwell which has led them to carry out a search in Cork. Officers investigating the 45-year-old’s disappearance have set up a search site at Castlemartyr Wood. At a media briefing this afternoon they told reporters that 40 acres of the extensive woodlands site will be searched over two to three weeks for evidence relating to Tina Satchwell’s disappearance. Superintendent Colm Noonan said that there have been 220 separate lines of inquiry, including liaisons with Interpol. Gardaí had previously conducted searches in the Youghal area in connection with this investigation. He said that investigators would like members of the public to contact them in regard to activity in Michel’s Wood in Castlemartyr in March 2017. The public will not be allowed access to the area during the search period, as the site will be sealed off. The Satchwell family was informed before the search began, gardaí said today. We are in regular contact with the Satchwell family and they have been informed of this search operation today. You will appreciate that this is a very stressful time for them and I would urge that they be afforded privacy at this time. Tina Satchwell was last seen at her home in Youghal on 20 March 2017. She was reported missing four days later by her husband Richard. Email “Gardaí search woods after getting 'key piece of intelligence' about missing Tina Satchwell ”. 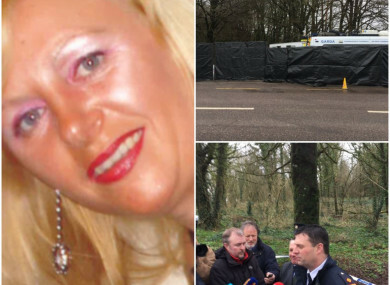 Feedback on “Gardaí search woods after getting 'key piece of intelligence' about missing Tina Satchwell ”.